The mobile app is included in all pricing plans currently available with the Xacte Medical Billing Solution. With it, physicians and optometrists can maximize their practice time. 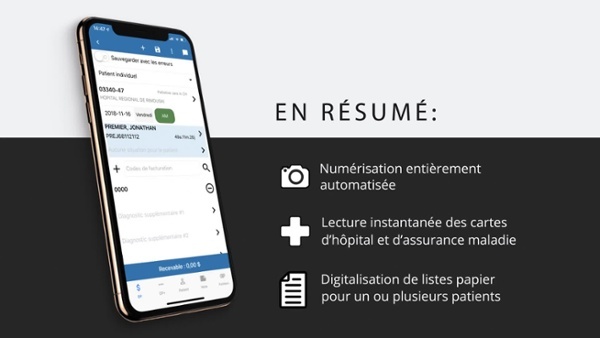 From their mobile devices, users can, among other things, automatically scan a patient health insurance number (NAM) and quickly create payment claims through an intuitive electronic castonguette adapted to each specialty. With the Xacte mobile app, it's now possible to automatically scan your patients' NAM (single or multiple) from your mobile device, without any manual entry required. Simply scan a health insurance card or document (paper or electronic) that has one or more NAM on it. The mobile app will automatically recognize the NAM and even eliminate duplicates. It only takes a few seconds for all data to be routed to the Xacte billing system. This exclusive innovation has been specifically designed to save valuable time for healthcare professionals. From a mobile device, the health professional can quickly select the procedure they have just performed. It works just like the paper castonguette. The difference is that with the electronic castonguette, the selected procedures are immediately integrated into the medical billing system. No additional input is necessary and all risk of transcription errors is eliminated. The Xacte mobile application has a system of geolocation that automatically register the workplace in the billing request. This feature is especially useful when a health professional is traveling to several different institutions. Already an Xacte user? Download the mobile app, available for both iOS and Android, to have full access to your medical billing from anywhere, anytime.